As I mentioned recently, back in June I spent a very enjoyable afternoon exploring the huge foodies event, Taste of London. As well as eating lots of beautifully prepared sample dishes, I was lucky enough to spend time with some of the producers showcasing their products. One of these was the Australian tea maker T2. T2 was created over 18 years ago by Maryanne Shearer, with the first store opening in Fitzroy, Australia. Maryanne had a background in product development & visual merchandising and she wanted to give tea a modern re-invention, opening it up to a whole new generation of tea drinkers. Now there are over 60 stores in Australasia, the US and the UK, each one offering daily tea tastings and a table filled with teas to help you to discover which flavour and aromas you like best. 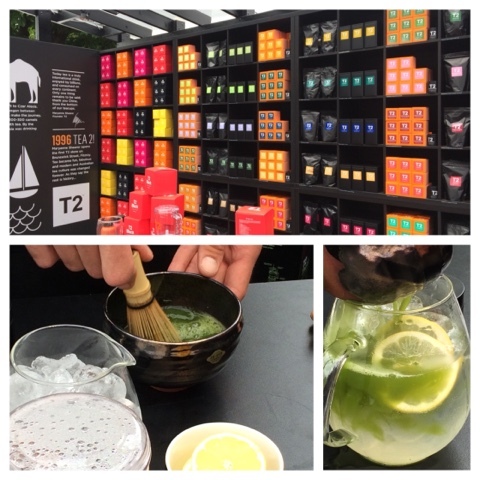 The T2 stand at Taste of London was no different. One entire wall was filled with the different varieties of tea, with exciting flavours like Toasty Nougat, Strawberries & Cream & Liquorice Legs. For every variety that was on the shelf there were opened samples of the loose blends for you to touch and smell. I was encouraged to try lots of different samples to see what sort of blends I liked - the chai was STUNNING! 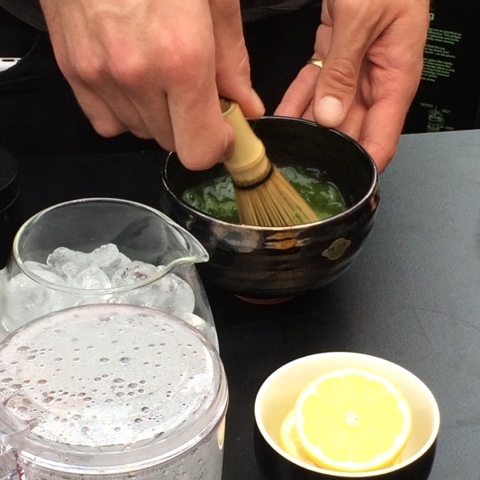 Then it was onto the most highly prized, star of the show - matcha tea. This is a green tea that comes in powdered form. 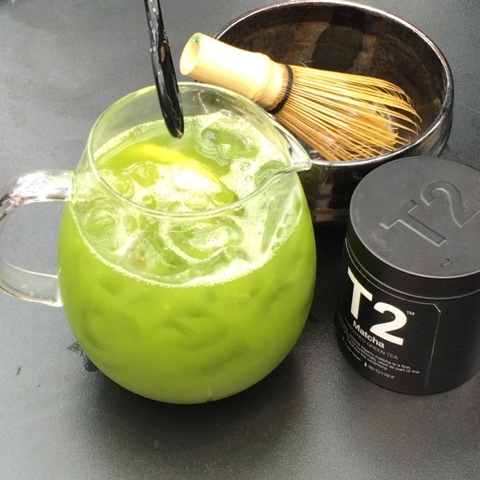 T2's matcha is 100% organic and is priced at £15.00 for 30g. 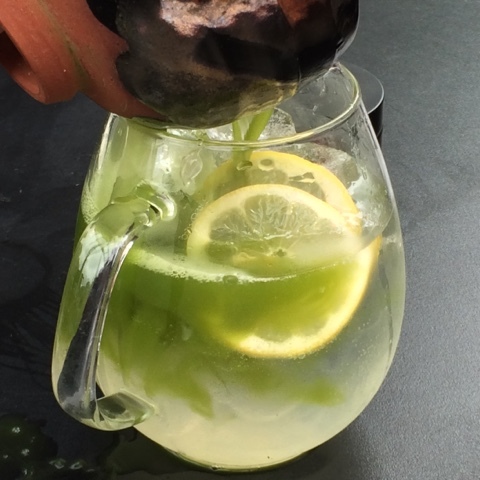 It was explained that matcha can be an acquired taste, but there was a way of making an iced tea that I was bound to love. A small amount of tea was placed into a bowl and water that had boiled & cooled for a few minutes was poured over. This was gently whisked using a special whisk until it was starting to froth and then it was slowly poured into a jug of sparkling water and ice cubes. Finally their was a quick squeeze of lemon to cut through the drink and it was ready to be served. My verdict? The most refreshing, clean tea I have ever tasted. My T2 blender was brilliantly knowledgeable and answered all my questions. He and all the other staff I spoke to had such passion and pride in their products, it was a pleasure to spend time learning about the company and their range of teas. Sadly though my time with the T2 boys had to come to an end. Not before they helped me choose a blend to take away with me, along with a really handy individual travel flask that comes with an infuser. My Strawberries and Cream tea really does smell and taste of strawberries & cream and its perfect for these hot summer evenings. One teaspoon of blend is enough to make 2 cups of tea. The cube is 100g and retails for £7.50 and I would think there would be a good 20-30 teaspoons in each pack. T2 products are available on their website, they also have six stores in the London area and are planning on opening more soon. A visit to their Westfield Shepherd's Bush store is already pencilled in for August. T2 very kindly provided me with my travel flask & tea free of charge, but they did not ask me to write a review. All words & opinions are my own. Thanks Cathy - take a look at their website, they've got so many flavours and a box lasts forever!! Thank you Mummy & Bean, the flask comes with us on every road trip now! Wow that looks amazing - what beautiful tea! Sounds like it tastes lovely too.